Dear Club Members and visitors, we are pleased to announce the new template release and long waited concept. Sport Line was made with great pleasure and many new features and ideas. Unmatched Joomla template layout, 22 module positions and 5 new Joomla extensions will make sure that your website stays in long lasting memory of your visitors. Sport concept was one of the missing links in our Joomla templates family and we gave our 110% to bring you the best of the best for you Joomla pleasure. YJ Sport Line - Very light quality premium template for CMS JOOMLA! 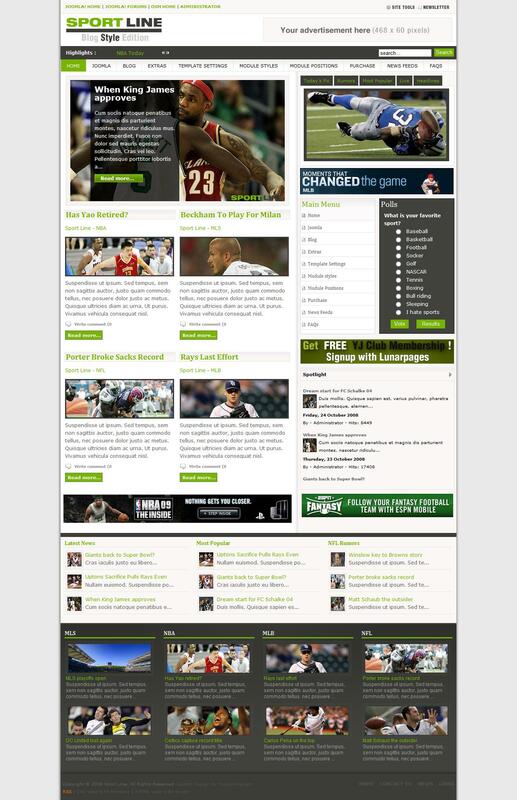 1.5 from the studio YouJoomla news portals for sports subjects. In this sport template implemented 22 modular positions and 5 new extensions.